The current armed conflict in Ukraine was triggered because the signing of the association agreement with the EU in Vilnius last November was called off. With a new President running the country, the agreement was finally signed in Brussels on Friday during the EU summit. 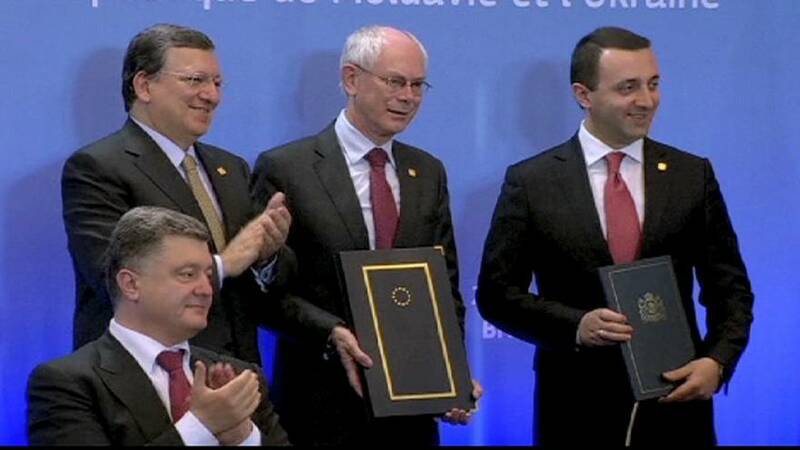 At the same time, similar agreements were signed with two other Eastern Partnership’s countries: Georgia and Moldova. “In Kyiv and elsewhere, people gave their lives for this closer link to the European Union,” said the president of the European Council Herman van Rompuy. The Eastern European leaders are hoping this is the first step on the road to full EU membership. This is particularly the case for new Ukrainian President Petro Poroshenko. “Over the last months Ukraine paid the highest possible price to make her European dreams come true; it must be worth something; for instance, to finally consider a simple statement on the part of the EU: once Ukraine would be ready, it will be in. A statement that could cost the EU nothing but would mean the world to my country,” said Poroshenko. Now the partnership agreements have been formally signed by all 28 EU leaders, all eyes will be on how the Russian leadership reacts. Moscow remains concerned about its neighbours drawing ever closer to the West and these former Soviet countries drifting out of its sphere of influence. The signing of the agreements is considered an historic moment for the EU, despite ending up in a “cooling” of relations with Russia. To analyse the impact of this event, euronews correspondents in Brussels interviewed the Prime Ministers of Moldova, and Georgia, Iurie Leanca and Irakli Garibashvili, as well as the Russian ambassador to the EU, Vladimir Chizhov. During his interview, Prime Minister of Moldova Iurie Leancă was asked if he is not worried his country’s relationship with Russia would deteriorate in a manner similar to what happened with Georgia. “Once you’ve chosen your path, once you’ve set your objective, you cannot show hesitation or weakness. You just need to show determination and then the result will be the one you expect. That’s why the Ukrainian lesson to us is that we need to be more determined in pursuing reforms, in showing to our people the results of these reforms and to explain that european integration is the only alternative if you want to create a modern, sustainable, functioning state,” Leancă told euronews. Prime Minister of Georgia Irakli Garibashvili thought that the agreement signed with the EU will encourage citizens of the self-proclaimed independent states of Abkhazia and South Ossetia rejoin Georgia. “When our brothers in Abkhazia and Ossetia see the big changes in our country, they will see the developed infrastructure, the developed agriculture, the developed education, health care, social conditions, they will also, one day, want to join and reconcile,” said Garibashvili. Russian ambassador Vladimir Chizhov doubts whether relations between his country and the West can get any worse. In his opinion, there are too many common interests to risk any more of a falling out. “You know, this talk about a second cold war, I think is misplaced. The cold war, as a phenomenon, was primarily an ideological stand-off, of two completely different ideologies, which of course were feeding practical policies in the diplomatic field and also in the military field. But the essence was this incompatibility of the two ideologies; it’s no longer there. I don’t see any problem between Russia and the West that cannot be solved by diplomatic means through negotiations. So I hope that reason will prevail,” explained Chizhov.